The annual Product of the Year recognition, now in its 24th year, recognizes innovation in manufacturing products. According to the publication, this award sets the manufacturing and engineering industry standard for new product achievement. Award recipients are determined based on votes received from the readers of Plant Engineering Magazine, whose job roles include plant managers and plant engineers. 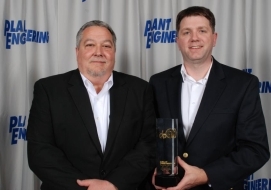 This achievement was formally acknowledged before an audience of the nation's leading plant managers at the 2012 Plant Engineering and Control Engineering Awards Dinner in Chicago. "Toyota is honored that our 8-Series 4-Wheel AC electric lift truck was recognized by Plant Engineering and its readers," said Jeff Rufener, president for TMHU. "Having top industry decision makers select our forklift as the top of the line validates Toyota's commitment to producing products with the highest level of quality and durability." Toyota's line of 8-Series 4-wheel AC electric lift trucks is available in 4,000 to 6,500 pound load capacities. Ideally suited for virtually every indoor material handling need, from food and beverage to general warehousing and distribution centers, this AC-powered lift truck delivers longer runtimes and offers quicker acceleration, elevating the industry standards of productivity, efficiency, durability and safety. With the 8-Series 4-wheel AC-powered lift trucks, Toyota offers its customers improved performance speeds?including up to 21 percent faster travel speeds over the previous model. Celebrating 45 years of established operations, Irvine, Calif.-based TMHU is the supplier for the No. 1 selling lift truck in North America since 2002. In addition to the full line of high-quality lift trucks sold under the Toyota brand, the company's extended industrial equipment solutions include Automated Guided Vehicles and tow tractors.